The first recorded death was in 1993 - the suicide of Kimpua Nsimba, a 24 year old refugee from Zaire, in a UK detention centre; the last recorded death was on 6 May 2018. The List has details of 34,361 known deaths of refugees and migrants trying to make new lives in Europe. The details include names, ages, gender, places of origin and causes of death - drowning, suicide, murder - but there is a distressingly high number of mass drownings where few other details were recorded. 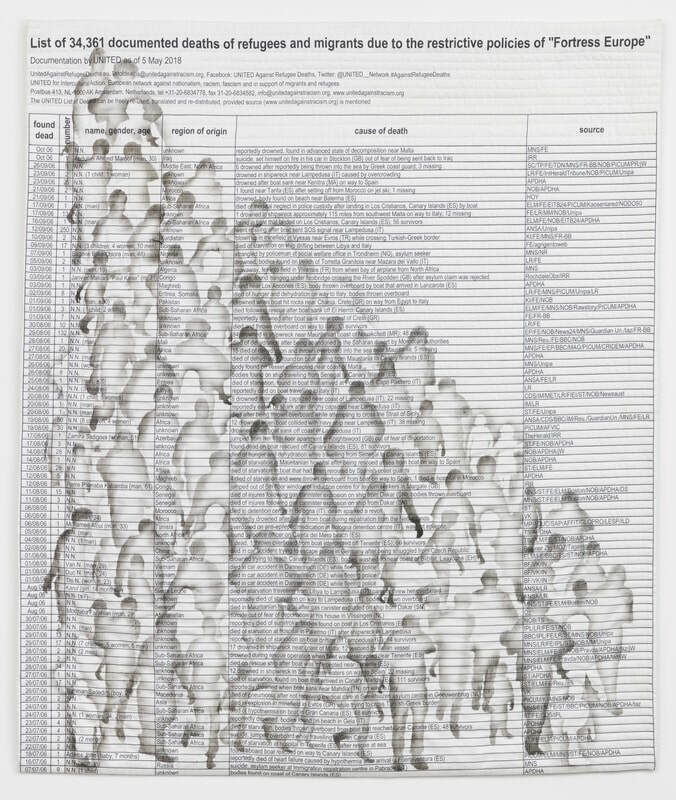 I knew that I needed to make an artwork responding to The List, especially as permission was freely given to use the data, providing the source, www.unitedagainstracism.org was acknowledged. The catalyst was the call for entry by SAQA (Studio Art Quilt Associates) for the next Global Exhibition 'Forced to Flee' in May 2019. 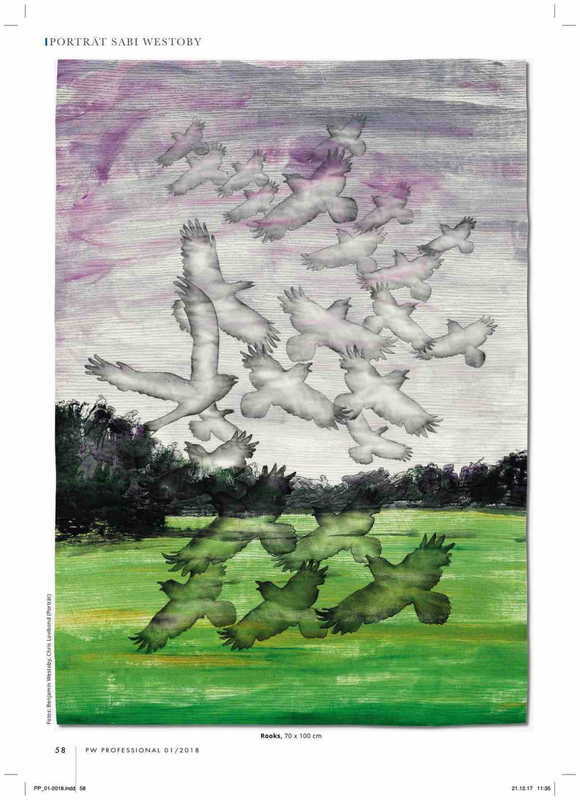 You can see how I made my artwork by clicking on the Works tab above. 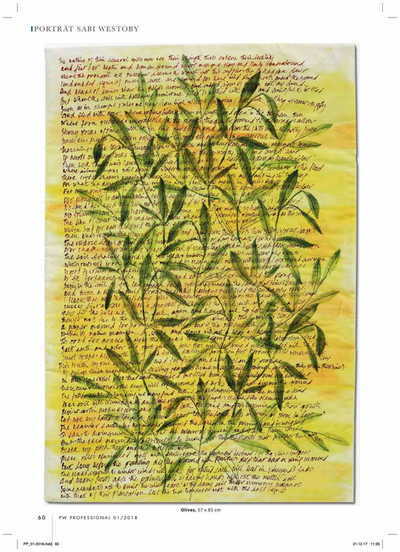 ​I was delighted that my piece, 'Page 27 - Exodus 1', was selected for inclusion in the exhibition. My gratitude goes to United Against Racism for their generosity in allowing The List to be used by artists. In 2018, the Centenary of the end of World War 1, thousands of commemorative events were organised across the country and the village of Swingfield in Kent was no exception. My friends, Steve and Barbara, played an important part in fund-raising, planning and, eventually setting up the events leading up to Armistice Day. 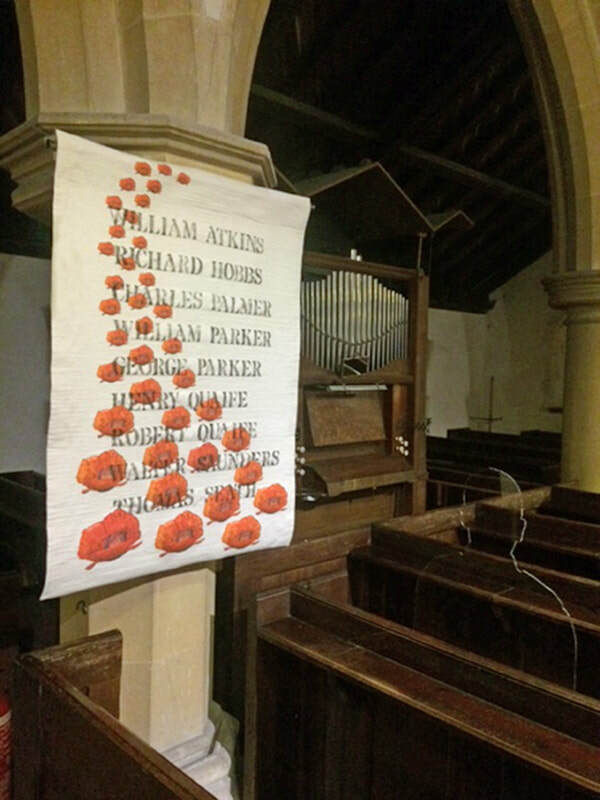 ​Nine men from the village, including two pairs of brothers, had died in the Great War and their names were eventually carved on the lychgate of St. Peter's Church. One of the planned memorials was to have life size acrylic silhouettes of the men seated on pews in the church - still present though absent. I felt compelled to make a contribution to remembering the deceased and the choice and size were left entirely to me. It didn't take me long to work out a design that was simple but striking. 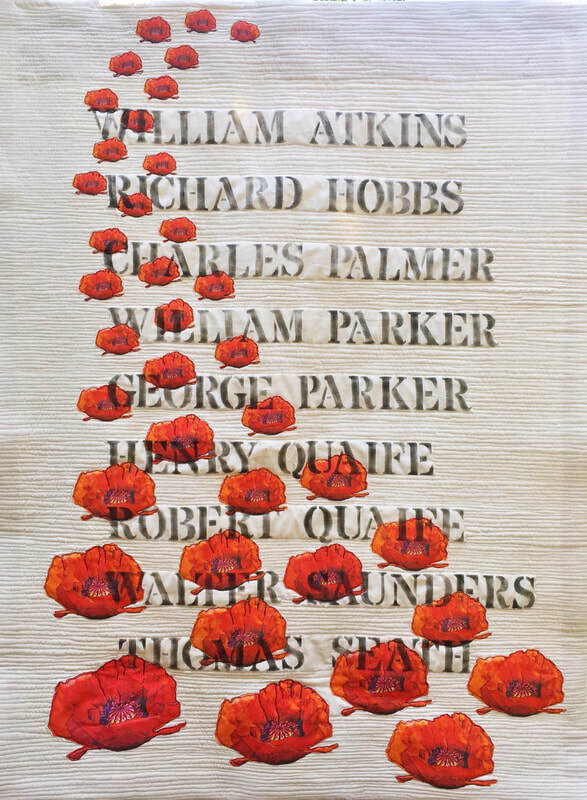 The names of the men were stencilled onto fabric using a military style font and images of poppies, from my photograph, were printed onto fabric and fused down. The whole piece was then machine quilted. ​This picture shows the quilt hanging in situ, in St. Peter's Church. I particularly like the rather ghostly acrylic silhouette of the soldier. 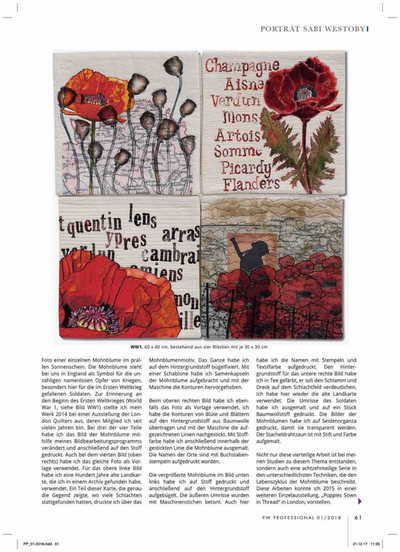 Having made many quilts on the theme of the poppy, this will probably be the last one, perhaps fittingly, given that the centenary has just passed. So far 2018 has been a busy and exciting year - two groups to which I belong have shown work at two separate venues. 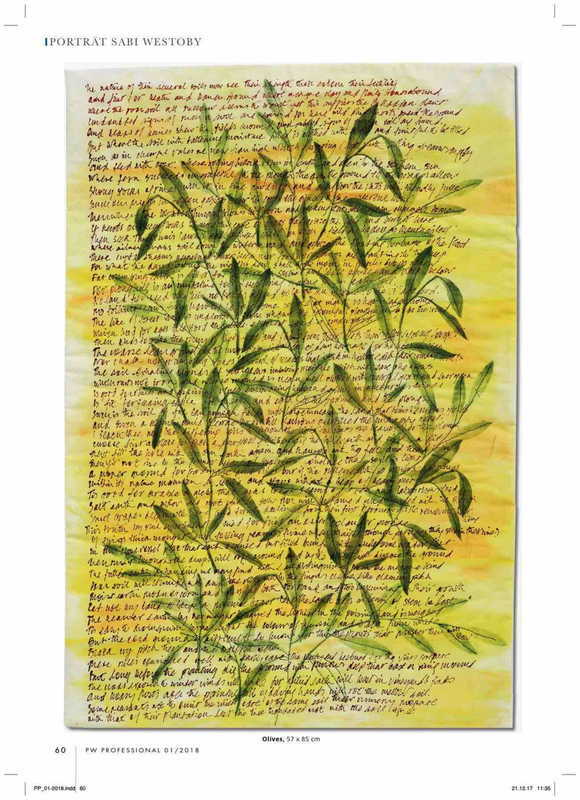 And it was an opportunity for me to explore in some detail my subject for my exhibition pieces based on Dryden's translation of Virgil's Georgics. The first in time was 'Contrasts' with All Threaded Together at the Yarrow Gallery, Oundle, Northamptonshire, 3 - 16 March. The group consists of former students of Brenda Boardman who meet once a month to exchange ideas and encourage each other. Most importantly, it is an exhibiting group - pictures and details of the exhibition are accessible with this link: www.allthreadedtogether.com/exhibition-2018. 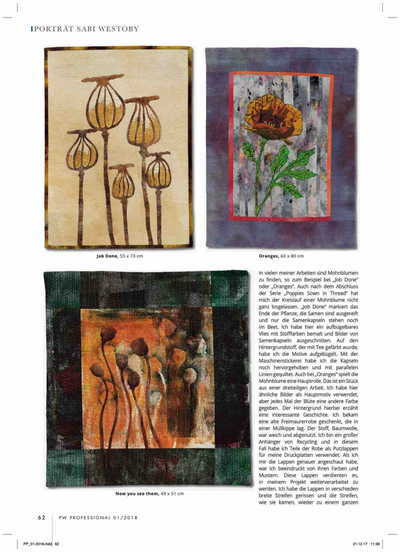 ​The second exhibition, 'Into the Fray', was with New Horizons Textile Group at Cowslip Workshops, Launceston, Cornwall 27 March - 8 April. The exhibiting group is a long running one, formed in 1993, and which I joined in 2016. You can see pictures of the exhibition here: www.newhorizonstextilegroup.com/into-the-fray.htmlwww.newhorizonstextilegroup.com/into-the-fray. The third show is 'Connections', also with New Horizons, was at the Festival of Quilts, Birmingham, 9 - 12 August. This is the largest quilting and patchwork show in Europe with about 30,000 visitors over four days. ​So Virgil got a lot of exposure! 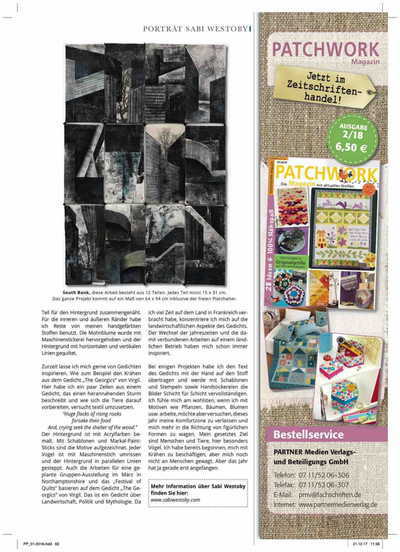 Dorothee Crane, the editor of Patchwork Professional, a German quilting and textile art magazine, approached me last year with a view to doing a feature about my work. 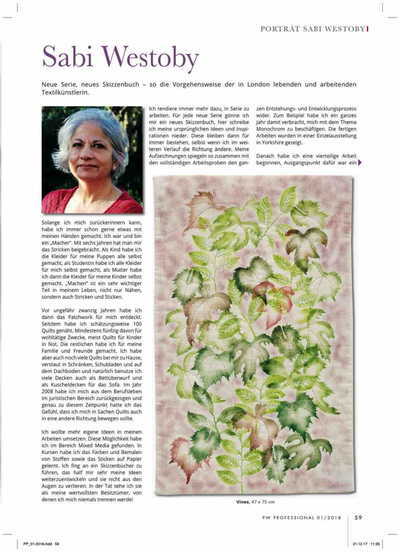 I was delighted to work with her, all by email and telephone, and the magazine was published in January 2018. ​With her kind permission, the article is shown below, in German. I was delighted that my piece, Southbank 13, was selected to be shown in venues in the USA in 2017. And it has now been chosen to travel to three venues in Europe this year.